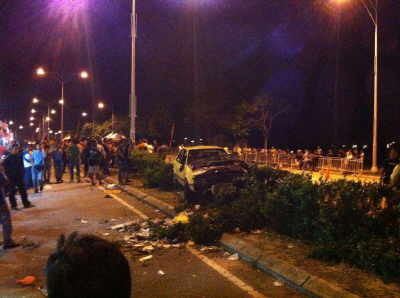 In the recent national youth event of “Million Youths Rally 2012″ in Malaysia, a drag race which was one of the event’s program that took place on Saturday night in Putrajaya ended disastrously. What happened was one of the cars which went on a trial run went out of control and skidded out of the road and went heading towards the spectators. The accident took place during the wee hours at Wadi Ehsan Highway at Precinct 19, Putrajaya. The whole fiasco lands 17 unfortunate spectators in hospital with 4 of them suffered serious injuries. The driver meanwhile escape unhurt. The drag race was canceled immediately and was pending investigation by the police and authorities. The video of the aftermath is at below. Our well wishes for the victims and hopefully they will recover soon from their injuries.